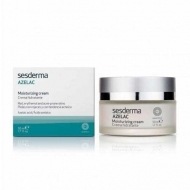 Treats the skin with acne and/or folliculitis. 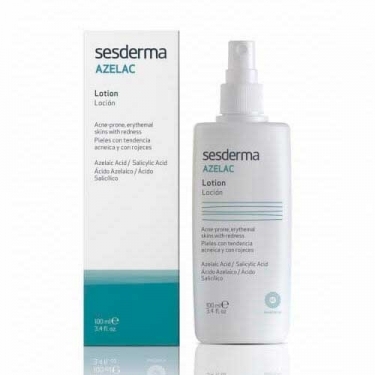 DESCRIPTION: Azelac Facial/Body/Hair Lotion from Sesderma is a lotion for the prevention and treatment of folliculitis, acne and comedones. Formulated with 5% Azelaic Acid and 2% Salicylic Acid, it has anti-bacterial, antifungal and soothing action while regulating the production of sebum and improving the appearance of acne-prone skin. Recommended in cases of difficult beards and problems related to shaving or waxing. It can be applied to the face, body and scalp. Apply with a cotton on the affected area. Apply 2 times a day until the disappearance of the lesions. Apply daily a few hours before shaving or immediately after depilation. Ideal for prevention and treatment of folliculitis.